chicken coop we were short on both time and money. over the years since we first started raising chickens. regular or oversized door would make coop cleaning a whole lot easier. choose how big you want to go. 3. Make it a tight fit. year or two, but eventually a local predator will come sniffing around. Here are some mistakes or lessons learned from our urban area as we begin building our second. 2. Plan for deep bedding. Make sure door thresholds and access doors are high enough off the ground so the bedding doesn’t spill out and effect the doors from shutting easily. 3. Removable and/or easy to clean floor. Our new coop will have a tray that will have deep bedding in it (including sides) with linoleum in the bottom so when the bedding is changed it can be pulled out and dumped easily into the compost bin. 4. Make the floor high enough that the bedding can be raked out directly to a wheel barrow (if needed see #3 above). Also make sure the coop is high enough that the feeder can be kept under the coop outside so it is protected from rain. Having the feeder in the run will reduce the footprint of the coop. 5. Predator proof means 1/2″ hardware cloth all around the coop and run when they are unattended. 7. Access to electricity for keeping the water unfrozen during the winter is necessary. 8. 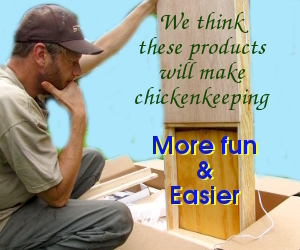 Making the feeder and waterer easily refillable without having to enter the coop or run is good for out of town trips.